Hundreds Run the Brooklyn Waterfront Greenway! Brooklyn Greenway Initiative’s event on October 19, 2014, “Brooklyn Greenway ½ and 5K” was a great success with a large turnout! 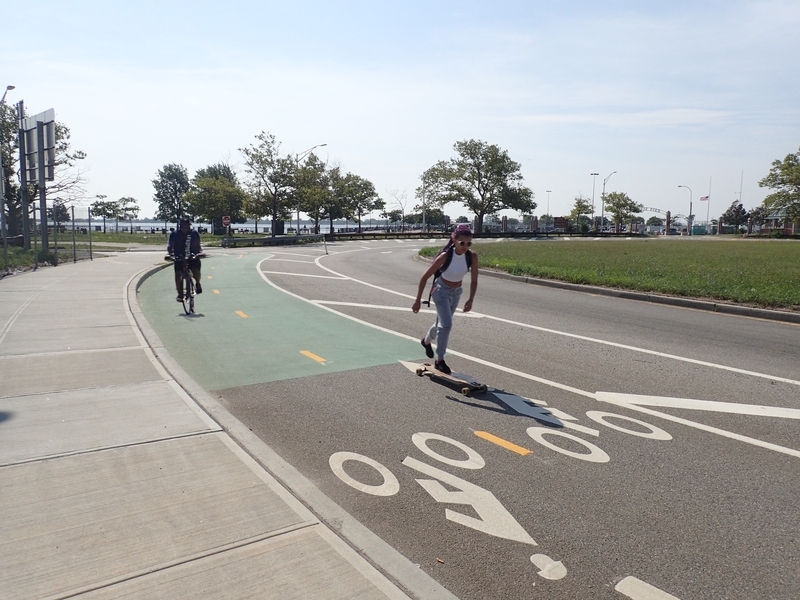 Earlier this year, a greenways project on E 102nd St and E 106th St calmed traffic and created new connections between the recreational facilities of Central Park, East River Greenway and Randall’s Island. Please join NYC Department of Transportation at the second round of community workshops to plan the future of the Jamaica Bay Greenway. NYC DOT installed salvaged granite blocks (recycled from the Willis Ave Bridge) near Van Brunt and Sackett St in Red Hook Brooklyn. Our event “Bike & Hike the Jamaica Bay Wildlife Refuge” was a great success with a large turnout! Bike and Hike the Jamaica Bay Wildlife Refuge! Sunday August 10, 2014 from 9:30 AM to 12:30 PM Ride with the NYC DOT and Purelements to the Jamaica Bay Wildlife Refuge! Nearly 1,000 New Yorkers visited the Brooklyn and Queens waterfront on Sunday, July 27 for Brooklyn Greenway Initiative’s Epic Ride. NYC DOT provided assistance at the Floyd Bennett Field rest stop, where dozens of riders stopped to learn more about the Jamaica Bay Greenway. Art Ride: Guided Bicycle Tour of Rockaway! Sunday, August 3, 2014 from 9:30 AM to 12:30 PM. Saturday August 2 at 9 a.m. Come join NYC H2O, Audubon and the National Park Service for our volunteer beach cleanup of Fort Tilden beach. New Yorkers Ride to the Rockaways on the Jamaica Bay Greenway!